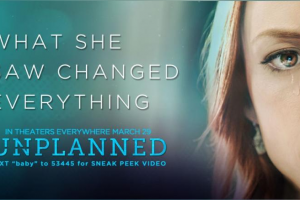 CBN—Unplanned, the new movie that tells the true story of former abortion clinic director Abby Johnson, took 4th place at the box office on the movie’s opening weekend. The film by writer-directors Chuck Konzelman and Cary Solomon, which is distributed by PureFlix, was estimated to have earned $6,110,000 through Mar. 31 after three days of release, according to the website Box Office Mojo. The film opened in 1,059 theaters across the country on Friday. It was the second-best opening weekend for a PureFlix film behind God’s Not Dead 2 ($7.6 million), according to The Hollywood Reporter. The movie stars Ashley Bratcher (90 Minutes in Heaven, War Room), Brooks Ryan (Overexposed) and veteran film and TV actress Robia Scott. As CBN News reported, the film depicts Johnson’s emotional decision to quit her job after watching an abortion via ultrasound. “It’s a little surreal, if I’m honest, to watch someone play out the worst version of yourself in a film,” Johnson told CBN News during an interview on the set of the film. “But it’s also just a good reminder that God can literally use anything from our past and use it for his glory and use it for his kingdom,” she added. For more information about the movie or to purchase tickets, click here. ‘At 13 She Can Get an Abortion… But She Can’t See This Movie’: What’s The Deal With R-Rated Pro-Life Film ‘Unplanned’?